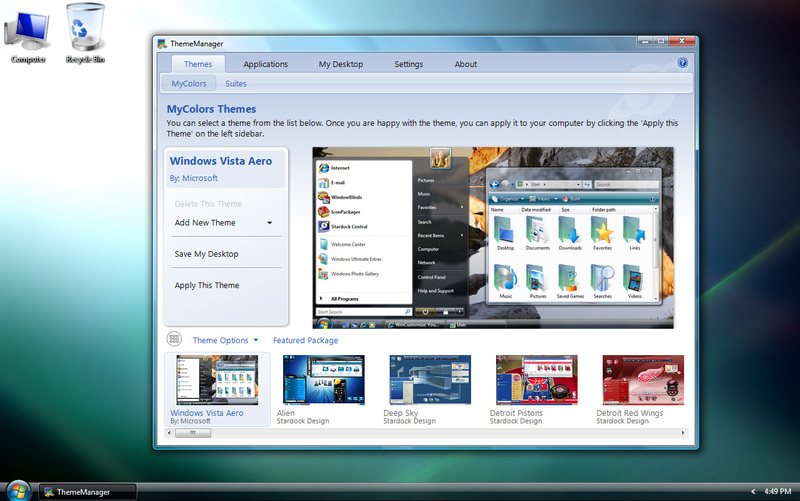 Theme Manager is a program that changes the look and feel of the entire Windows environment. It works by talking to existing desktop enhancement programs and then applying a MyColors or Suite file. In short, Theme Manager is a front-end to other desktop enhancement programs to simplify the user experience. Control your desktop experience Theme Manager, and manage all your skins, themes, wallpapers, icons, etc. from a single interface. * Apply skins, icons, wallpapers and more! Qweas is providing links to Theme Manager 3.0 as a courtesy, and makes no representations regarding Theme Manager or any other applications or any information related thereto. Any questions, complaints or claims regarding this application Theme Manager 3.0 must be directed to the appropriate software vendor. You may click the publisher link of Theme Manager on the top of this page to get more details about the vendor.